It's generally Vogue's purview to hock shoes that render your feet numb after walking five blocks in them — that is, toe-pinching stilettos, sky high heels, and other extremely expensive, gorgeous, but undeniably torturous kinds of footwear. But judging from a recent story on Vogue.com, it's possible that Vogue is ready to endorse Crocs. You heard me right folks, Crocs. Could it be that Vogue is finally ready to embrace comfort over couture? On Friday, Vogue.com posted a story suggesting various high-end outfits for your next walk of shame. Practical! They recreate a series of outfits from old Vogue editorials (which makes you realize how Vogue spreads look like very glamorous walks of shame) and some model off-duty looks from Instagram. In one of the inspo looks, worn by model Hanne Gaby Odiele, is a leather jacket, leggings, messy bun, charcoal sweater, and crocs. So I saw this look and wondered: Will Vogue endorse the Crocs, or will they find a super-fashiony shoe with only the most vague resemblance to Crocs? This is Vogue we're talking about here. It's an institution anathema to the heavenly pedal pillow that is a shoe made from ergonomic foam. Instead, they deal in pretty, precarious shoes that are meant to be carried in. But lo and behold, right next to the $2,420 Haider Ackermann pants that stand in for Odiele's leggings, stands a $20 pair of crocs. Sure looks like Vogue has applied its stamp of approval to what is perhaps the most laid back shoe of our time. Am I dreaming? 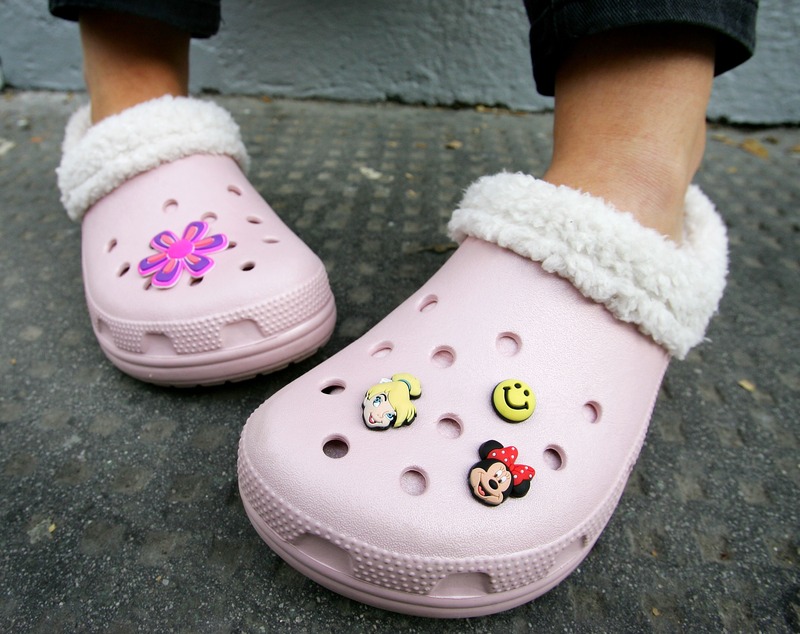 If we take this piece as a harbinger of fashion coming around on Crocs, it seems to be the fashion cycle as usual. Remember, after all, that the past year has embraced comfort: Birkenstocks, shower sandals, and Tevas are just a few examples. It's only fair that the eccentrically wonderful gardener duck sandals get their time in the sun. They've sure earned it.